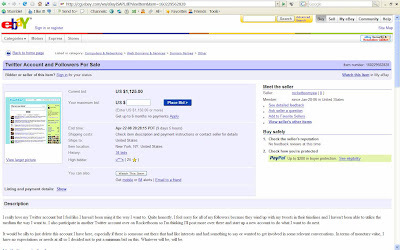 Rocketboom founder sells Twitter account on Ebay! Andrew Baron, founder of Rocketboom, is selling his Twitter account on Ebay, complete with 1397 followers (www.twitter.com/andrewbaron). This has been picked up on a few blogs and a screengrab of the Ebay auction for his Twitter account is below. "I really love my Twitter account but I feel like I haven't been using it the way I want to. Quite honestly, I feel sorry for all of my followers because they wind up with my tweets in their timelines and I haven't been able to utilize the medium the way I want to. I also participate in another Twitter account over on Rocketboom so I'm thinking I'll post more over there and start up a new account to do what I want to do next. It would be silly to just delete this account I have here, especially if there is someone out there that had like interests and had something to say or wanted to get involved in some relevant conversations. In terms of monetary value, I have no expectations or needs at all so I decided not to put a minimum bid on this. Whatever will be, will be." The sale of this Twitter account on Ebay is provoking a lot of comment on Techcrunch, especially as the sale or transfer of Twitter accounts on sites like Ebay does not contravene any of the terms and conditions of Twitter. When I looked Andrew Baron's auction was at $1125, which is close to $1 per follower. There is no technology transfer or IP involved, this is just the chance to buy a Twitter account with an established following. So how much are each of those followers worth? $1? $10? $100? Something else? Clearly the value in this is in the viral PR generated for Rocketboom (and the auction winner), but it will also be interesting to see how much Andrew Baron sells his Twitter account for and what the total amount works out to be per follower!